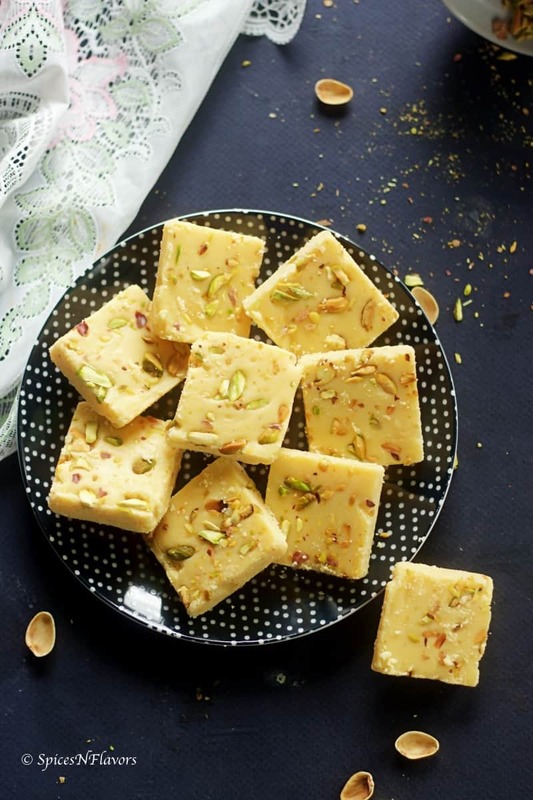 Milk Powder Burfi is a delicious Indian sweet that can be prepared in flat 15 mins. 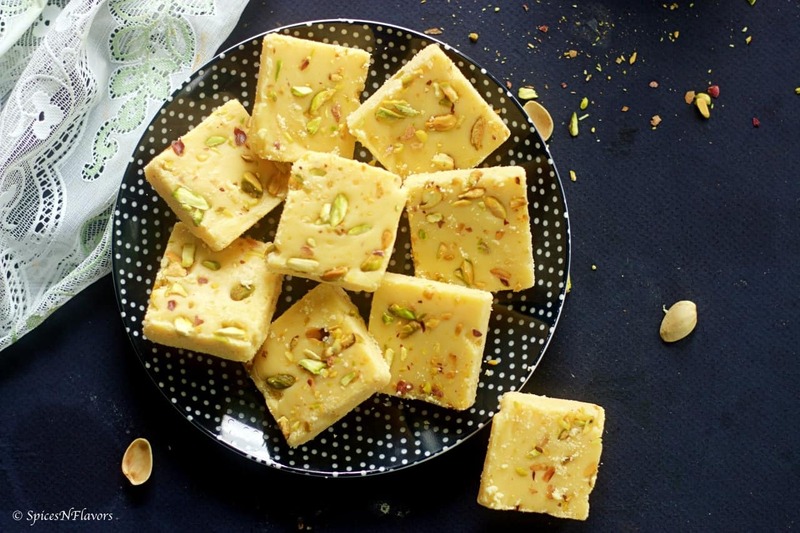 Milk Powder Burfi – the aroma of cardamom and ghee is already giving me the vibes of Diwali. Feels like Diwali is almost here. 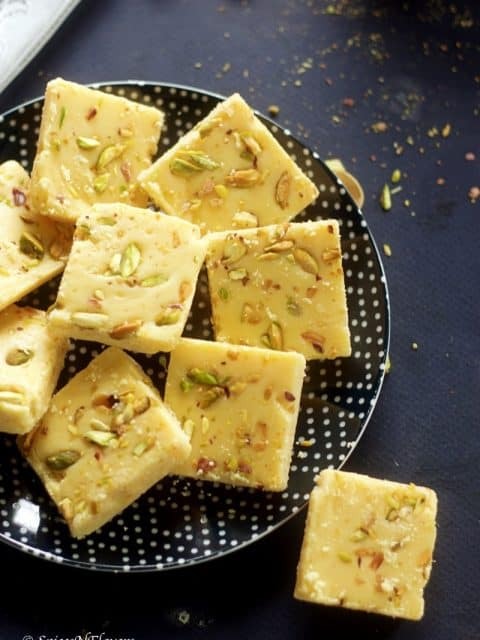 And why not after all its my favourite festival.. <3 <3 Diwali pe mitha na banaya aur khaya to kya jiya.. (Diwali celebration is incomplete without preparing and enjoying Indian sweet) How do you celebrate Diwali at your home? Comment below and let me know. At my home I clearly remember my Mom making Mixture – you know what I mean. And she used to literally make a tub full of it. I am not kidding guys I clearly remember the number of items she made and that too in bulk. There used to be so many things – Mixture, Shankar para, Karanji, Halwa, Rava Laddu, Murukku (3 varieties) and what not.. Phew the list seems never-ending. And what all things do I make. To be honest enough; you guys know that I have recently started cooking so the first year of marriage I literally did not make anything as I didn’t knew to cook then..
Third year I was in India.. hehe enjoying Mom’s food again. Now finally this is the year when I think I will actually make goodies for Diwali. So apart from making this Milk Powder Burfi; I will also make some laddu that I have already shared on the blog like may be No Cook Instant Rose Coconut Laddu or Oreo Laddu (kids favourite). I also have this No Cook Instant Coconut Barfi that I haven’t made in ages. Or may be I will also make this 18 mins Halwa as it comes together easily. Apart from our regular Indian sweets; this year I am planning to share some edible gifts with my friends; which I will upload asap. I also have 2-3 exotic cake recipes planned out. After a great success with Rava Cake; I might do Chocolate Rava Cake as well. So do keep an eye here for interesting Diwali recipes. So coming to this Milk Powder Burfi..
First of all you might note that this Milk Powder Burfi is yellow in colour rather than white. And why so? Well the colour here is coming from the ghee and milk powder that I have used. Both had little yellow tint to it. However this won’t be the case as the ones that we get back in India is much different to what I have used. A. The flame of your gas should always be on low-medium. Do not cook this on high flame. B. At all times you will have to stir it continuously or else it might burn at the bottom. C. Once the sugar is added do not cook it for more than 10-15 mins or else it would turn hard and chewy. 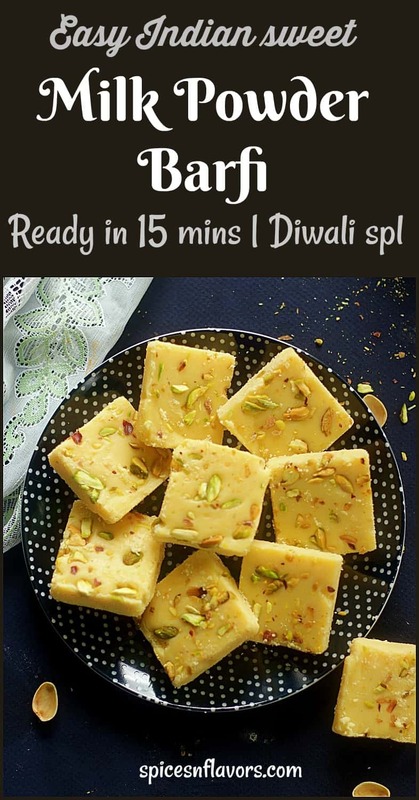 This Diwali enjoy this 15 mins Halwai style Milk Powder Burfi and impress your family with your cooking skills.. 😉 They won’t come to know that this is actually super easy to make. If you like this recipe then do tag me, tweet me or instagram me; I would love to follow you and your posts. Start by greasing and lining a pan with parchment paper. Keep this aside. Also chop some dry fruits to garnish. Keep this ready too. Once combined; add in the sugar. You will note that the mixture turns thin or runny. Keep stirring continuously until it thickens and starts leaving the pan around 10-15 mins. (Refer notes for test). After which transfer it to the greased tray. Smooth out the top with the back of the spatula. Add chopped nuts on top. With the help of back of the bowl press the nuts on top so that it sticks properly. Do remember to grease the bowl with some ghee too. Allow this to set at room temperature for 1.5-2 hours. 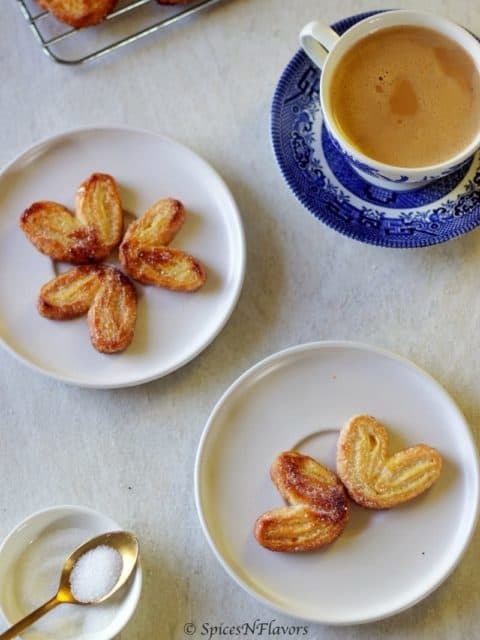 Once cold and set remove it from the tray; cut into desired shape and enjoy. 1. I mentioned using powdered sugar actually I have used icing sugar here. If you do not have icing sugar at home then simple grind the granulated usual sugar to a powdered state and then use. 2. The flame of your gas should always be on low-medium. Do not cook this on high flame. 3. At all times you will have to stir it continuously or else it might burn at the bottom. 4. Once the sugar is added do not cook it for more than 10-15 mins or else it would turn hard and chewy. 1. 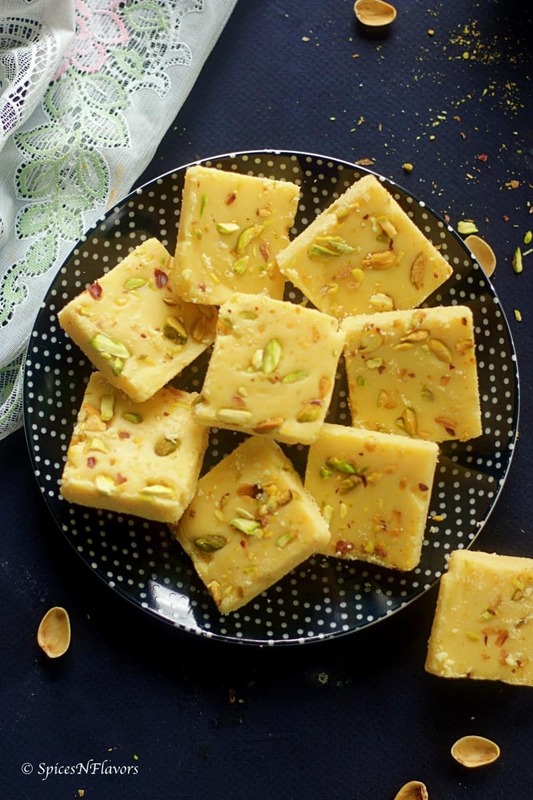 Add some kesar milk and make Kesar Milk Powder Burfi. 2. Add 3-4 tbsp of cocoa powder to make Chocolate Milk Powder Burfi. Trust me when I say this tastes absolutely divine just like the ones that we get in Halwai or sweet shop back in India. Thank you so much for taking the time out to try the recipe.. So I am assuming that you have cooked the milk powder for 10 mins.. the raw taste of milk powder goes away with that.. may be you would want to try with some other brand as if you have mixed it for 10 mins then this problem should not occur. 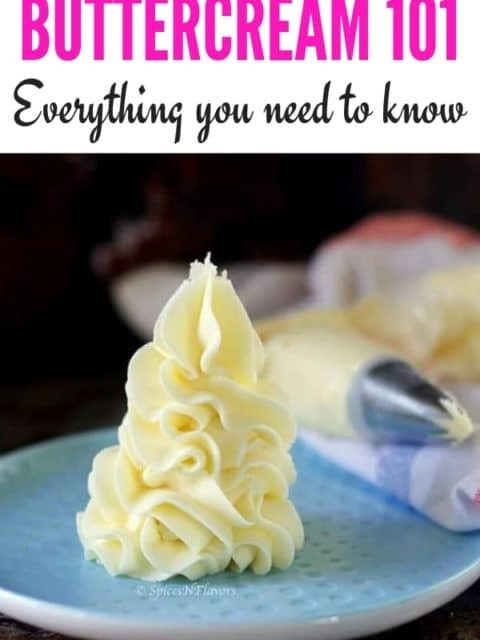 I had been searching for the easiest recipe n found yours. I must say it was yummy. I only added a little amount of elichi and it turned out perfect. That sounds perfect. I am so glad to learn that this recipe worked out for you. Thank you for sharing your feedback with us truly appreciate it. 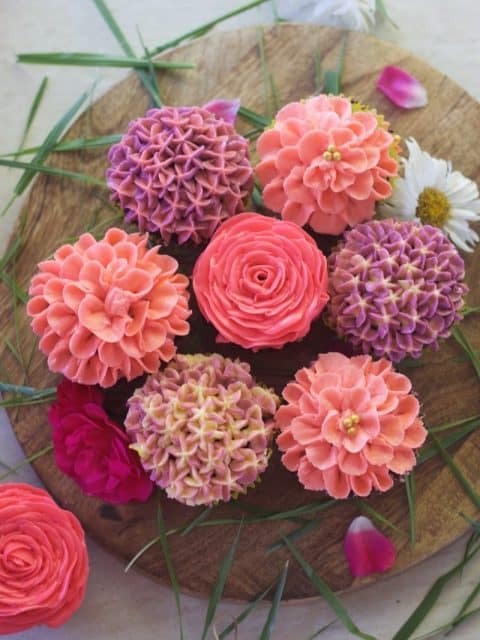 Can you add rose water and rose essence to make it a rose barfi? If so, how much rose water? Rose essence would definitely work.. Around 1/4 to 1/2 tsp would be enough.. start by adding 1/4 tsp as rose essence is pretty strong but would definitely work..
About rose water not pretty sure about the amount.. but if I were you I would start by adding 1 tsp of rose water..
Can we use jaggery melted into the cooked milk powder mix? 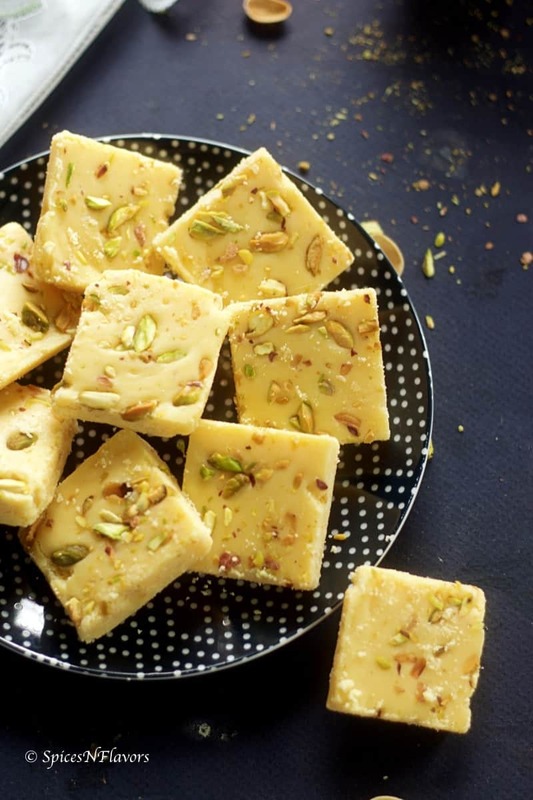 You can always try.. but I am not too sure how it would taste in this particular recipe.. even though the milk powder would observe the liquid and come together but I am not too sure about how it will set the burfi in terms of texture. sorry not of big help here..
Hi … can we use any carnation dry milk powder ? Or can you suggest good brand milk powder? You can use Nestle carnation milk powder for this recipe.. would work fine.. sorry for replying late.